Each piece is hand-crafted upon receipt of payment. Please allow 1-3 weeks for the creation of your custom jewelry. Please remember, each piece is hand-stamped and imperfections add to the charm. Please know that we take orders for all custom designs. Contact me through email if you have any questions. All our items are custom made and personalized just for you. We do not accept returns except in the event an error is made by us. Every hand stamped/personalized item is made to order and therefore is considered a custom order. We can't refund payments on custom orders, but we want you to be happy. Please email us at lovablekeepsake@yahoo.com and we'll see what we can do. If the error occurs on our end, we are happy to fix the item and refund your shipping fees to send it back to us. You can return any non-custom piece for store credit, minus shipping costs and a 30% re-stocking fee. For store credit, your non-custom piece must be in its original condition and returned to us within 30 days of its purchase date (include invoice in return package). Please email us at lovablekeepsake@yahoo.com to initiate your return. For your security, please return your item with an insured courier (FedEx, UPS, or SUPS parcel post) and hold onto your receipt. Lovable Keepsake Gifts is not responsible for items damaged or lost in transit. 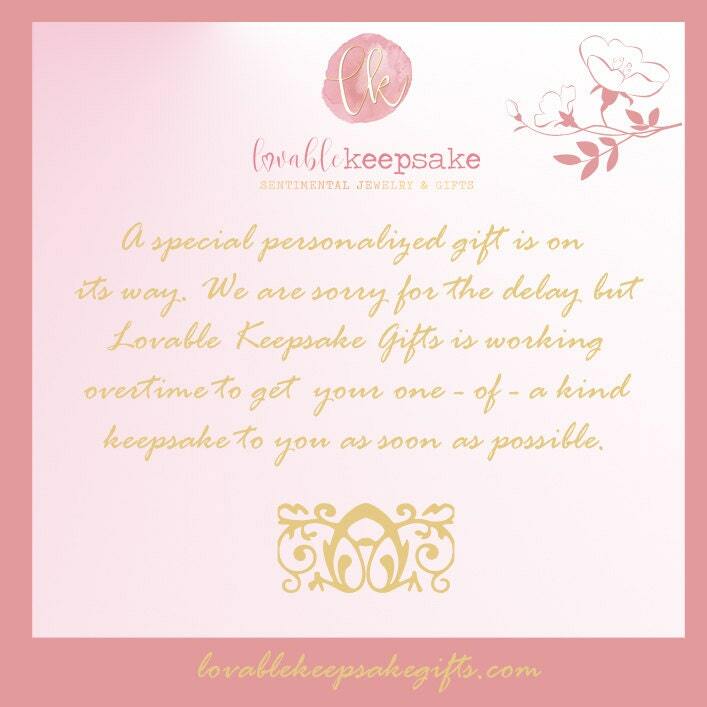 Lovable Keepsake Gifts respects the privacy of all our customers. No information about our customers will be shared with any third party except in the case of shipping carriers that will deliver purchases. We take PayPal, visa, MasterCard, Discover and AmEx for payment. A 7% sales tax applies to all orders shipped or billed to a New Jersey address. We ship to the address you choose during your checkout. Most orders are shipped within 2 to 3 weeks from the date of purchase. This does not include shipping time. During the holidays such as Christmas and mother’s day my turn around time can vary and be as long as approx. 3 to 5 weeks. Not including shipping time. Shipping international is $18.00 shipped First Class from the USPS. You will be responsible for all duty and taxes that are applicable. Please contact or email with any questions. Priority is available for international shipping. Contact us if you are interested in an upgrade as the price will be increased for shipping. For those of you who still want to purchase a keepsake design and time is running out you have TWO choices. You can order a GIFT CERTIFICATE to give to the recipient so they can choose their own design. Or you can go ahead and place your order and then print out our free printable gift note to give to the recipient letting them know a gift is on its way. Click this link. International shipping can take 2 to 3 weeks and sometimes over a month depending on the destination's customs regulations. Shipping international is $18.00 shipped First Class from USPS. You will be responsible for all duty and taxes that are applicable. Priority is available for international shipping. Contact us if you are interested in an upgrade. If you need something sooner for a gift such as birthday, anniversary, christening etc. please contact us and we will let you know if we can rush this for you. Occasionally items will go on back-order. We will let you know as soon as possible if this occurs. Around the holidays orders may be delayed. Normal shipping time is approx. 1 to 3 weeks from the date of purchase but during Mother’s Day and Christmas production time can be up to 3 to 5 weeks from the date of purchase. Not including shipping time. Feel free to contact us about your order. Wholesale accounts are available with a valid resale license. A minimum number of pieces are required. Email lovablekeepsake@yahoo.com for more information.